Chuma is the perfect place for excursions to view the Victoria Falls, trips around the small National Park, some fishing in the Zambezi, riverboat cruises or simply relaxing after a busy safari in the bush. Sitting on your private balcony in your exclusive treehouse is a wonderful way to spend the last few days of your safari. If you still want to see more game, the lodge provides a traditional safari vehicle for game drives within the zoological park. You can see White Rhino when you venture into the Mosi-oa-Tunya National Park. Chuma also lay on daily excursions to Victoria Falls, where you can wander along a rainforest path to numerous viewpoints revealing ever more spectacular sights. Umbrellas are provided to keep the spray off. This exclusive villa offers 2 bedrooms en suite, one double room with a bath and outdoor shower and one twin room with a bath and in-door shower, a spacious lounge and dining room area, kitchenette, outdoor verandah, barbeque area and private swimming pool. The second bedroom can be converted into a private office area with telephone and computer modem link. Additional facilities include Satellite TV and a fully stocked bar. Guests will have their own private chef to cook all meals and a private guide, vehicle and boat for all activities. Each of the treehouses are built into the living canopy of giant ebony trees and provide a private view of the Zambezi from their own private deck among the branches. 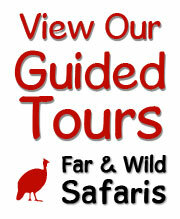 Full range of game drives in the National Park using an open four-wheel drive vehicle driven by your private guide, Nature walks in the National Park, Guided Tour of the Victoria Falls, Cultural trips to a nearby village and school, Livingstone Museum Tour, Livingstone town shopping Tour, Boat Cruises on the Zambezi River, Fishing, White water rafting, Canoeing, Sunset cruises, Helicopter and microlight adventures, Elephant back safaris, Bungi Jumping. Road transfers available from Victoria Falls town, Victoria Falls Airport, Livingstone airport and from Kasane in Botswana. Guests may self-drive to the lodge is they wish. The lodge is approximately 15km from the border town of Livingstone in Zambia. Children of all ages are welcome although children under 6 years of age are not recommended.